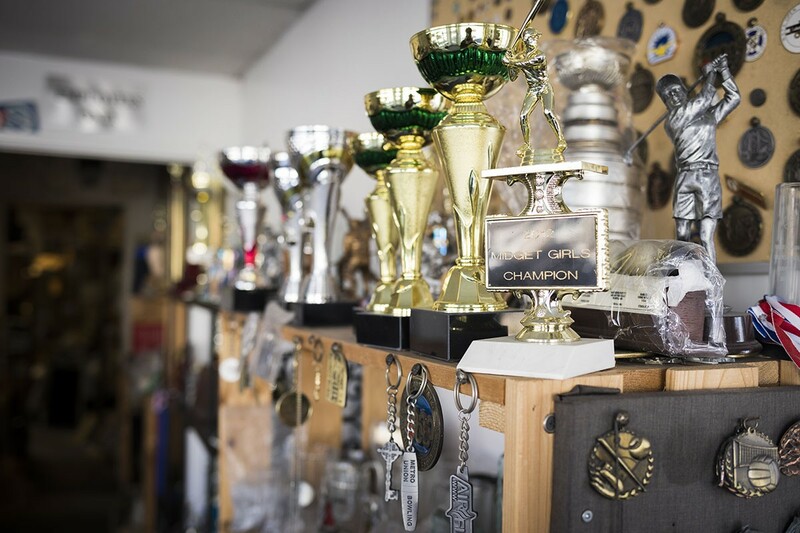 To mark 40 years in business, owner Mike McGuigan gives us a peek inside the trophy case. Mike McGuigan didn’t aspire to become a trophy maker. 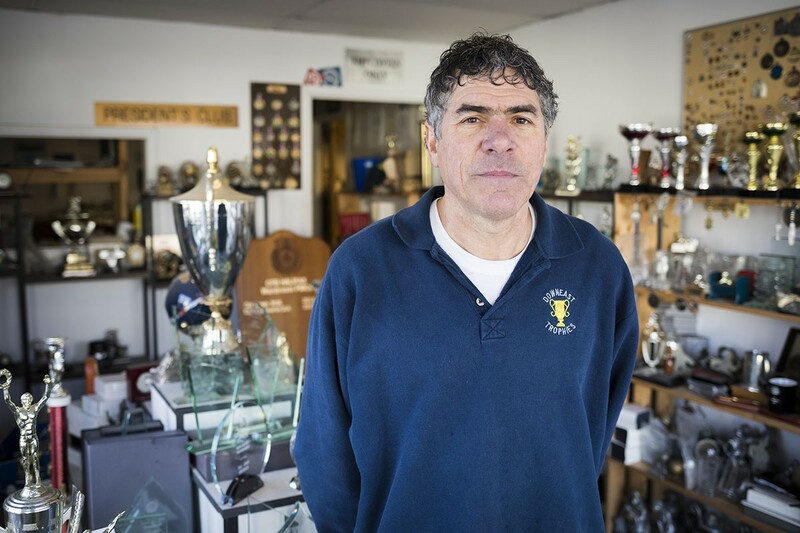 In 1980, fresh out of high school and wondering what to do with his life, he was tasked with running his father’s new north end business, Downeast Trophies. At the time, he had no idea that this would become his career, and that one day he would look back on 40 years of trophy making with a sense of accomplishment. “My dad and I were proud of this place,” McGuigan says. He taps the name plate on his office desk that reads, “Ed McGuigan.” “He’ll always be a part of the business. We did it all together.” His father passed away almost nine years ago, but his legacy is still alive and well. Upon arriving at Downeast Trophies, customers are often greeted by McGuigan’s faithful assistant, Molly. The 13-year-old golden retriever is never far from his side. Molly has a bed in his office and a stash of treats on the top shelf—just out of reach. Over the years, she has become synonymous with Downeast Trophies, and McGuigan makes sure to close every business email with “From Mike and Molly.” The store’s showroom is lined with shelves and bookcases of stock trophies, plastic signs and plaques and bulletin boards tacked with custom medals and lapel pins. In the centre of the room is a tiered stand piled high with trophies and glass awards, and at the very top sits a silver cup attached to a base of green marble. McGuigan and his father bought the cup in Italy in 1979 as their showpiece, and, as you may have guessed, it’s not for sale. McGuigan credits much of Downeast Trophies’ reputation to his father, who taught him that honesty is the best business quality. “Whatever their needs, I’ll try to accommodate them,” McGuigan says about his customers. “Whether it’s a five dollar order or a 5,000 dollar order, you treat everyone the same.” He enjoys watching customers gaze at the trophies on display, and he swears he has seen middle-aged adults light up like kids as they poke around the shop. “Everybody likes to be recognized,” McGuigan says. “Whether you’re five or 55, if you get an award as an accomplishment, then that’s something you can look back on and be proud of forever." Take a look inside the west end’s ’50s-inspired, “dripping in extra” tattoo shop.